I pick up a pair of Blaklader pants a year or so ago, and picked up a second lighter weight model just a few moths ago. I have had to time to spend with both models and have come to the conclusion that they are the best work pants that I have ever used. Not only do the pants have a ton of great features and are tough, but they are also very comfortable. Could Blaklader take these already great pants and make them any better? Well it appears the answer is yes, with the addition of their X1600 work pants. One of the key factors for the durability of Blaklader pants is their use of super-strong Cordura fabric in areas of the pants that see the most abuse. 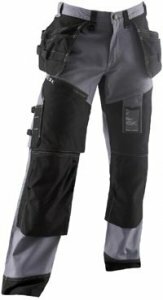 The old pants use this Cordura fabric for the kneepad pockets, but the new X1600 pants use Cordura for the kneepad pockets, most of the front of the pants, and now the utility pockets. Even the leg cuffs are wrapped in Cordura. If you look at the photo, everything in black is Cordura fabric, the rest of the pant is made out of 13oz 100% cotton fabric. The X1600 pants also feature some new design changes. Under the right Cordura leg shield, on the thigh, is a zipper pocket that can be used to store gloves, or a hat. The kneepad pockets now feature two different shelves to hold kneepads, and better allows the pants to fit all body types. You might also notice the pants have more loops, pencil slits, and even a place for a jobsite ID badge. There is no mention of price, but I know Cordura fabric is not cheap; regular Blaklader pants cost around $50, so you should expect to pay a lot more for the X1600 that will be coming out this September. If I could make a request, I would ask that Blaklader make more color options available as well as different fabric weights. I live in sunny SoCal, and do not want to wear anything black or anything that heavy in the summer.